In our OCR community at large, everyone has a story to tell. The stories from members of our community most often contain the reason why they signed up for their first race, and continue to keep going when times are tough. 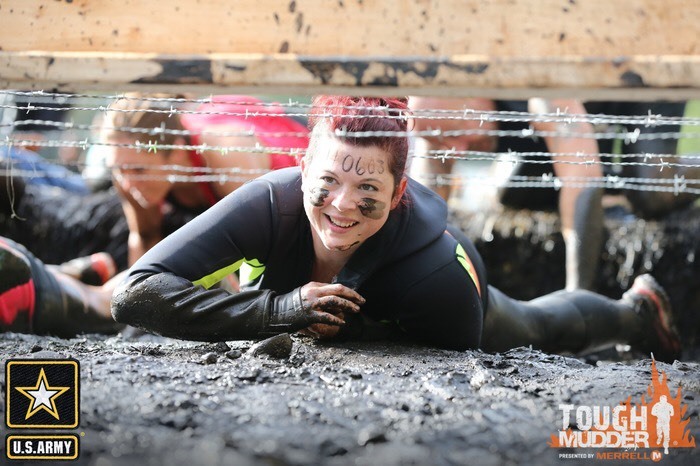 Kim DeVoss suffered two back-to-back tragedies in her life, Tough Mudder brought her back to life, out of the darkness. I wanted to share her story with you all, as sometimes being Badass is simply getting up every day and doing that one thing that makes you smile, even on your darkest days. My name is Kim DeVoss and I’m 33 years old. I live in California with my husband and a house full of animals. I grew up spending most of my weekends in the mountains camping, fishing and tracking animals; so I love being outdoors. I am an artist and I love running OCR! Not particularly. I was an awkward kid that got teased a lot so I didn’t have much confidence in myself. Soccer was the only sport I ever really liked to play and I did that through High School. I often used running for exercise but I didn’t start really enjoying it until I was in my 20’s. I love the feeling I get after a good run. It’s more rewarding to me than any other type of exercise. I sort of stumbled into it. I had run a few road races and I liked challenging myself to keep improving my time. Then I participated in a 5k mud run and absolutely loved it. I ended up signing up for a bunch of different mud runs after that and pushed myself to do better each race. I felt like 3-mile races were just a little too short for me and I would still have plenty of energy at the end of each race. I wanted to test my limits, so when I saw an ad for Tough Mudder, I signed up. It was 10-12 miles and that distance sounded like it would be a real challenge to me. My first Tough Mudder was in 2014. It was in Patterson, California. I was there to run it alone and I was really nervous. I had no idea if I was going to be able to do it. I met some people at the very beginning that just welcomed me into their group. I ran the entire course with them and I have never felt so accepted and encouraged by a community as I have with OCR. That first event was hard! There were quite a few steep uphill climbs that felt like they went on forever. People really came together to encourage each other through the hard times on the course. I don't think I have ever been more proud of myself as when I crossed my first Tough Mudder finish line. It was the biggest adrenaline rush. I ended up going home and signing up right away for another that same year. Some of my first few races were Rugged Maniac and Mud Factor. Both were fun and introduced me to obstacle course races. Though, since my first Tough Mudder; I've only been focusing on TM events. I feel I'm with family every time I'm out there. I love the fact that Tough Mudder focuses on camaraderie, and at every obstacle, people are there to help and encourage you. There is something so fun about running outside and getting dirty, but I also like pushing my limits. That is what OCR does. I'm drawn to long distance and endurance races because it is incredible to see how people can push themselves to achieve the unachievable. There are so many incredible female athletes in OCR right now and I admire them so much! The funny thing is; I don’t picture myself as a strong woman. I’m just very determined. I consider myself a mediocre athlete overall but I give it my best. I've had people call me tough and I just think that if I can do it anyone can. I truly hope that I have inspired other women to try something out of their comfort zone and find their own strength. It's wonderful to see more and more women competing in OCR events. It definitely inspires more women to join the sport. This is such a hard question but I think my favorite obstacle is Block Ness Monster. It’s a Tough Mudder obstacle that is designed to require teamwork to complete. There are large spinning blocks in water that need to be rotated so people can make their way over and advance forward. I'm always drawn into the big teamwork obstacles. I have a love/hate relationship with heights that didn't start until recently. I used to love jumping off of things. I've cliff jumped from different heights but now find myself getting a little nervous every time, but I also still love the rush. I can’t say never about any race. I might start out thinking a race sounds impossible and then slowly my mindset will change and after a while, I want to try it. With the correct training, I’d try anything at least once. It makes life interesting. I am a planner for sure. Participating in this sport can get expensive so I normally buy all my tickets as soon as they are available and at the best price. I already have my whole 2018 year scheduled out. It’s nice this way because I have a clear focus and can work towards a goal. I’d like to get to a point that I can be more spontaneous with my race choices. There are a variety of good races out there that I want to try. Absolutely! They inspire me to be more competitive! I’ve always just gone out and given it my best at the time without really preparing myself first. I didn’t do any specific training other than running which alone just isn’t enough. This year I am really focusing in on my weaknesses. I want to build strength and endurance. Seeing all the incredible women in OCR recently has been a huge influence on me. The more confident I get in myself the more I think I’d like to run more competitively. I don’t expect to become a top athlete or anything but I’d like to get back to setting personal goals and then crushing them. I’ve treated OCR like a hobby but it’s turned into my lifestyle. Mostly running because it’s what I know and love. It’s what I’m strongest at and in my comfort zone. But as we know, OCR is about getting out of our comfort zones. So now I’m working on my upper body and grip strength daily. I'm converting my garage into a little home gym and I use a nearby park for some workouts. Swimming is going to be the next thing I add to my training schedule this year. What is a nickname people have for you? I don’t really have one but I have been recognized by my bright red hair so I guess that’s something. A strong mindset is so important to have. If you believe in yourself, everything else will follow. You need to believe you can do it because you can! My parents. My mom raised my sister and me to be strong women. She believes in me and supports my love of OCR. My dad taught me to be tough. He struggled with some medical issues for years but he never let his pain prevent him from doing the things he loved. I want to be like that. He passed away a few years ago and I can't help but think of him when I push through my own issues. I know he would be proud. World’s Toughest Mudder! It has been my ultimate goal since 2015 and I am running it for the first time this year. It's been such a big goal I haven't even consider what will be next. I prefer endurance races over sprints. I would like to eventually run the Ragnar Trail Relay. I went through some difficult losses in 2016 and the friends I’ve made through OCR are such a big support system. The community really helped me through my hardships. 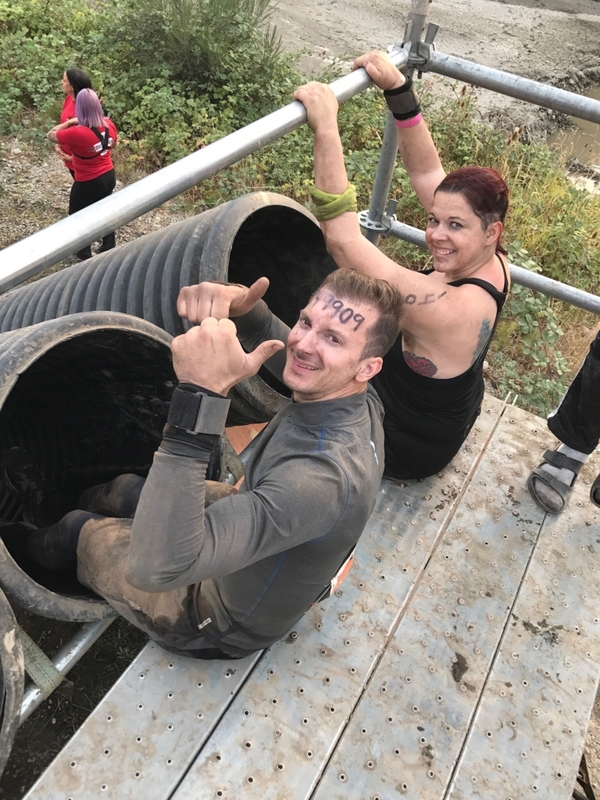 I felt genuine love and support from my OCR friends and Mudder family. This love and support I received inspired me to create a spirit animal series in my artwork.